Drivers need to ensure their own safety and that of others on the road any time they enter their vehicles. When it rains or gets windy or frosty, it becomes difficult to see the road clearly. That is why you need the best wiper blades available to clear your windshield of water, debris, and streaks that affect your vision. Wiper blades come in various sizes and shapes. 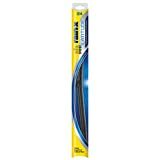 It is advisable to buy the best wiper blades from reliable manufacturers. In this article, we have made your work easier by providing an in-depth review of the best wiper blades on the market. This article will help you make an informed decision when buying the right wiper blades for your car, truck, van or other vehicle. Most first-time customers have common questions about wiper blades. We compiled those questions into a brief set of questions that will help you understand what wiper blades are, how they work, and where to buy them. Wiper blades are used to clean a car’s front windshield and sometimes the rear window as well. The two most common wiper blade types are traditional wiper blades and beam wiper blades. 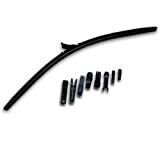 Traditional wiper blades have a metal-and-plastic frame which supports ordinary rubber or halogen-hardened rubber. They are widely used by most older-model car owners. The second common design is the beam-type wiper. These windshield wipers are shaped like a bow and lack a supporting frame. The actual wiper is made of silicone and a graphite mixture. They are some of the best wiper blades since they can last several years. They also work effectively in areas subject to very high or low temperatures. Wiper blades clean the windshield of a car. They are usually fixed to the bottom left and right areas of the windshield’s edges. They help improve your vision when you are driving by removing dust and water that accumulate on the windshield. They also help remove streaks. How Do Wiper Blades Work? Wiper blades are controlled from inside the car. They move from side to side when cleaning the16 windshield. They have different speeds depending on the amount of water or debris you need to clean. A traditional wiper blade has six pressure points on the frame. This allows it to press evenly against the car’s windshield and wipe off dust or water. Beam wiper blades are shaped more like arcs and they adapt to the shape of the windscreen when in motion. They can move faster than traditional wipers, but some are less effective. They also help prevent snow buildup since they lack exposed metal frames. Wiper blades are stocked in most auto parts shops across the country. You can also find them in supermarkets, hardware, or garage stores. Most cars come with pre-installed wiper blades. To get the best wiper blades for your car, check out the large selection on Amazon. They deliver wiper blades right to your doorstep. Which Are Better: Bracket or Beam Wiper Blades? To answer this question, we list the advantages and disadvantages of each wiper blade type we considered and offer a comparison. Beam wiper blades are lighter, conform to any windshield shape, last long, are aerodynamic; they are also expensive. On the other hand, bracket wiper blades are cheaper, easily accessible, and able to clear any debris effectively; however, they do not last as long, and they are less effective in very low or high temperatures. Our reviews were handled by experts who have multiple years of experience reviewing car parts. We experimented with each wiper blade we reviewed and then compiled our unbiased opinions. The review was in-depth, and we covered all the most important aspects of wiper blades. This includes each blade brand's features, pros & cons, price, availability, and warranty. The best wiper blades can be bought at very low price. The price is due to the differing quality of the wiper blades and their different manufacturers.They are sleek, aerodynamic, last several years, and can work in extreme conditions. Traditional wiper blades are more affordable and work efficiently in optimum environmental conditions. 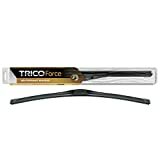 This is one of the best beam wiper blades in the market. The wiper is made of specially blended rubber that gets the work done even in extreme conditions involving snow, ice, or high temperature. It is an OEM-quality wiper blade. The aerodynamic wiper blade design produces less noise and also resists being lifted by strong winds. Finally, the lack of a frame means less or no snow and ice buildup. These blades use HighGlide treated rubber for a less noisy and smooth wipe. The aerofoil uses VorTec technology to convert wind force into pressure applied when wiping the windshield. Swift Easy Connection Technology makes installation easy and fast. Since the outer layer is made of high-quality synthetic material and is not exposed, there is no debris that can get stuck and cause problems later. These blades use DuraKlear exclusive rubber that cleans the windshield and leaves no streaks. A KwikConnect installation system enables each blade to be installed (and removed) quickly and easily. A vented bridge ensures the wiper blade fits well across the windshield. This wiper blade is made of specially blended rubber with a graphite coating, which ensures a smooth wipe. It can also withstand extreme weather conditions, hold up against strong winds and produce less noise. The contour design fits perfectly on most windshields and grips tightly, ensuring a streak-free wipe. This is an economical conventional-type wiper blade. The blade itself is made of natural rubber while the frame is made of high-strength steel. All the steel is coated with corrosion-resistant epoxy. These wiper blades have direct-fit connectors, which makes them easy to install. This blade design uses patented Smart Flex Technology and independent steel frame suspension. This allows pressure to be evenly applied to all areas of the windshield. The contour design of the blade fits most vehicles perfectly. This is one of the best wiper blades in the market. The Valeo 900 Series uses Tec 3 rubber technology on the wiper to ensure a quiet and streak-free wipe. The blade is suspended by integrated flexors that provide proper windshield installation. The extra-flat, aerodynamic design ensures it can perform with less drag when the wind speed is high. This is one of the best wiper blades to use during winter. The wiper is made of pure rubber which ensures it squeezes out all the moisture, snow, and any debris from the windshield. 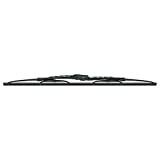 Robust wiper frames can take on challenges like strong winds, heavy rain, and dense fog. This blade design uses dual rubber technology on the wiper. This allows smooth operation that efficiently clears the windshield without any "chatter." It also uses a weather-shield connector that keeps ice from building up. It does not use metal or plastic hinges and brackets. This ensures it does not fall off in performance over time. There are hundreds of wiper blades in the market. All promise satisfaction. Without the right information, you could purchase wiper blades that do not serve you well. To ensure you get the best wiper blades in the market, be sure to look for affordability, weather resistance, a perfect fit, and durability. Keep in mind: Most beam wiper blades are more durable than bracket wiper blades. ​Having performed extensive research to identify ten of the best wiper blades in the market, we can confidently declare Rain-X Latitude Wiper Blades as the best wiper blade. It lasts for several years, covers the entire windshield, is compatible with most cars, and is affordable for most buyers. With this guide, we hope your hunt for quality wiper blades becomes quick and successful!